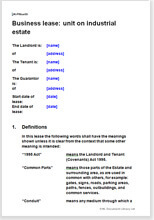 This lease has been drawn for letting a unit on an industrial estate or business park. The use could be for any purpose, such as a workshop, factory, depot or warehouse. The unit could be one of a block under one roof or a stand-alone building. The lease includes the use of shared services on the park or estate, such as security, access roads, signs and parking and many other practical points. All the features you would expect and many practical options. Full service charge provisions are included. If you want to let a stand-alone unit with no common services provided, you could look at Workshop, factory, barn lease.